“[It] put the spotlight on an issue that people already knew was important, but it also helped drive the agenda towards a solution. And I think it was incredibly effective. The forum had a direct impact on the policy. 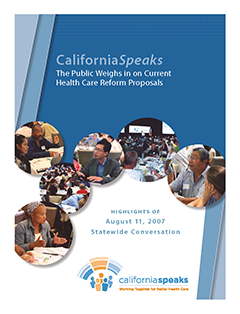 CaliforniaSpeaks: Working Together for Better Health Care — On August 11, 2007, some 3500 randomly selected Californians gathered in eight cities statewide, linked by the Internet, to discuss the major problems and proposed solutions for our health care system. I was one of 24 on a “theme team,” analyzing feedback in real time, for a report to the state government and mass media. Governor Arnold Schwarzenegger, Assembly Speaker Fabian Núñez, Senate President pro Tem Don Perata, Assembly Republican Leader Mike Villines, and other Republican and Democratic legislators attended the event, sponsored by the Blue Shield of California Foundation, The California Wellness Foundation, and The California Endowment. Feedback from the participants was analyzed in real-time by a panel of 24 select participants, including yours truly, to develop questions based on emergent themes, on which the entire statewide group voted. A final report based upon the results was presented to the participants, media, and lawmakers — all of whom gained a greater sense of urgency for bipartisan solutions to this crisis affecting everyone. CaliforniaSpeaks was organized by AmericaSpeaks. AmericaSpeaks is a non-partisan, non-profit organization with the mission of providing Americans with a greater voice in the most important decisions that affect their lives. AmericaSpeaks has engaged more than 145,000 citizens across the country on such topics as shaping municipal budget priorities in Washington, D.C.; creating regional plans for greater Chicago and Cleveland regions; and developing rebuilding plans for the World Trade Center site in New York City, and New Orleans following Hurricane Katrina. CaliforniaSpeaks convened thousands of Californians in a statewide conversation to make choices about health care reform. 1) Electronic keypads were used to capture participants’ votes throughout the day. 2) Networked-laptop computers were used at each table to capture ideas generated through small group discussions. 3) A satellite system linked the eight meetings sites. The statewide conversation took place simultaneously across eight meeting sites in San Diego, Riverside, Los Angeles, San Luis Obispo, Fresno, Oakland, Sacramento, and Humboldt County. Participant discussions were supported by more than 400 skilled facilitators who volunteered their time to support the small-group dialogue. The statewide conversation took place with about 3,500 Californians across the eight meeting sites. In order to ensure that a diverse group of Californians participated in the discussion, CaliforniaSpeaks randomly identified and contacted 120,000 people across the state by phone and mail. To encourage participants to attend, CaliforniaSpeaks mailed more than 300,000 letters to Californians, including letters from the Governor, Senate President Pro Tem, and Speaker of the Assembly. To encourage participants to attend, CaliforniaSpeaks made well over 2,000,000 phone calls to Californians across the state. CaliforniaSpeaks was created by AmericaSpeaks with the support of three nonprofit foundations: Blue Shield of California Foundation, The California Endowment, and The California Wellness Foundation. Additional funding was provided by the Alliance Health Foundation, the Sierra Health Foundation, and the San Francisco Foundation.